MSD 8.5mm Super Conductor spark plug wire sets feature a special helically wound core that has just 40-50 ohms of resistance per foot—but with an RFI suppression equal to a 1,500 ohm wire. In fact, each foot of finished wire includes 40 ft. of tightly wound copper for superior conductivity. This winding procedure, combined with a ferro-magnetic impregnated center core, produces an extremely effective Electro Magnetic Interference "choke." This choke, or suppression capability, keeps the EMI inside the wire where it cannot interfere with other electronics on your vehicle. A tough, 8.5mm synthetic/silicone jacket over an extra-heavy glass braid and dielectric insulator keeps the current guided to the plugs. Underneath the high-temperature boots, dual crimp stainless steel terminals feature snap-locks to ensure a secure fit. Each set comes with clip-on cylinder markers for easy identification. 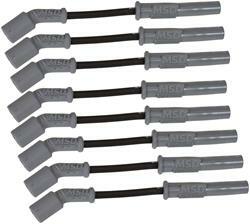 MSD's 8.5mm Super Conductor wire sets are available in custom or universal-fit applications. Chris, the 32813 wire set will fit your 2010 Camaro. I just put them on my LS3 corvette and they fit fine. Will these fit my 2003 GMC Yukon 5.3? Savon, the 32813 wire set should fit your G8 with the 6.0L just fine. Tested the resistance, and it's exactly in-line with MSD's claim. Terminals snap on perfectly. Quality kit. Excellent build and quality, significantly better than OEM or others on the market. Connections have a definitive "click" when snapping on to terminals. I installed them in my GTO, and I can feel the difference when I turn on the car. Great product. I have JBA headers on my 2006 GTO, #3 plug tight. I have JBA headers on my 2006 GTO, #3 plug is a tight fit and touches the pipe. Holding up good thus far. Good product. These wires are great. Once installed they bended easily to make clearance away from my header. Correct fit, parts came quick and on time, exactly as shown in picture. Thanks Summit.